We all know we’d do just about anything for the comfort of our pets, and for some people, that includes home renovations. I came across a fun article in the Wall Street Journal that shows how some families have made changes to their homes that make it more convenient to care for their pets while at the same keeping their homes neat and attractive. The creative upgrades range from hidden litter boxes to dog doors discreetly tucked under stairwells to feeding stations built into a kitchen island. When I did a kitchen renovation recently I definitely designed it with the dogs in mind. I hated the eyesore of the pile of leashes, keys and other dog-care accessories that I tried to organize with baskets and buckets—but it always just cluttered up the countertop. American Cabinet Refacers happily accomodated my request to increase the width of a tall cabinet they were building for me by 4 inches and put a door on the side. 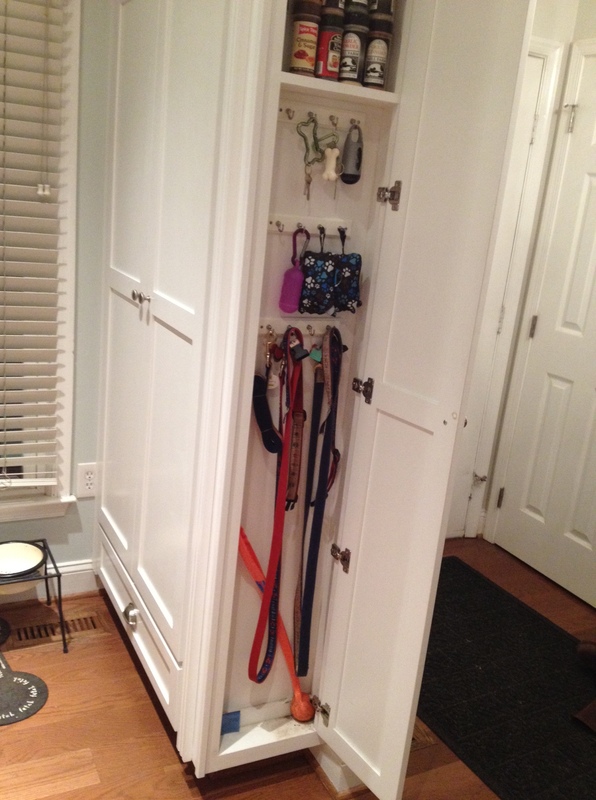 I then installed a number of inexpensive key hook racks and created a single, hidden space to store all my keys, leashes, the Chuck-it, doggie raincoats, and more. If you’re not planning on renovating anytime soon, there are still lots of products to help you keep your home clutter-free, attractive and dog-friendly. For example, the “TownHaus” from In the Company of Dogs, which is a hardwood dog crate that looks like a bedside or end table, but provides a comfortable shelter for your pup. Or the hardwood and powder-coated metal artisan-crafted gates that come in swirl and giraffe patterns.